Learn how to conduct a workshop, a short educational program designed to teach or introduce practical skills, techniques, or ideas. Why would you give a workshop? When would you want to conduct a workshop? How do you conduct a workshop? You've probably been a participant in a number of workshops. You may have been at a folk festival where a famous performer held a guitar workshop and demonstrated some of his techniques. You may have been at a conference where there were workshops on surfing the internet, or on selling to reluctant customers. There are workshops on subjects ranging from cake decorating to treating schizophrenia, all of which are limited in time, meant to teach practical skills or techniques or ideas, and conducted by people like you. Now it's your turn to conduct a workshop. You may be training staff or volunteers for a new organization, presenting at a conference, or trying to show the world this terrific new method your organization has developed. Whatever the case, you're going to have to entertain, educate, and edify a group of people you've probably never met before. That may sound frightening, but running a workshop is really very much like anything else: if you prepare well, stay relaxed, and respect the participants, it'll go fine. They're generally small, usually from 6 to 15 participants, allowing everyone some personal attention and the chance to be heard. They're often designed for people who are working together, or working in the same field. They're conducted by people who have real experience in the subject under discussion. A presentation doesn't have to be limited to one person. Co-leaders or co-facilitators are not only common, but can greatly expand the possibilities of a given workshop, and can make everyone's job easier. Each co-leader might be responsible for particular parts of the workshop, or all may work together throughout, depending upon the structure and purpose. In any case, finding one or more co-leaders or co-facilitators is always an option if you're planning a workshop. They're often participatory, i.e. participants are active, both in that they influence the direction of the workshop and also in that they have a chance to practice the techniques, skills, etc. that are under discussion. They're informal; there's a good deal of discussion in addition to participation, rather than just a teacher presenting material to be absorbed by attentive students. They're self-contained. Although a workshop may end with handouts and suggestions for further reading or study for those who are interested, the presentation is generally meant to stand on its own, unlike a course, which depends on large amounts of reading and other projects (papers, presentations) in addition to classroom activities. Why choose a workshop, when you could use some other method like a study circle, a course, on-the-job training, etc.? Because there are a number of different ways to teach people things, and because people learn things in different ways, a workshop has some advantages (and some disadvantages, too, most notably the lack of time it provides) over these other methods that make it a good choice in certain circumstances. A workshop provides a way to create an intensive educational experience in a short amount of time, when the time for a more comprehensive effort may not be available. Participants may be working, they may be too far apart to gather together regularly, or may simply be unwilling to commit large amounts of time. A workshop can introduce a new concept, spurring participants to investigate it further on their own, or can demonstrate and encourage the practice of actual methods. It's a great way to teach hands-on skills because it offers participants a chance to try out new methods and fail in a safe situation. Failure is often the best teacher, and failure in this instance doesn't carry a cost. At the same time, feedback, from both the presenter and peers in the group, helps a participant understand what she can do to avoid failure in a real situation. A workshop is a way for someone to pass on to colleagues ideas and methods that he has developed or finds important. Teaching a graduate course may not be possible, but he may be able to reach large numbers of people by conducting workshops in various situations. Especially for people who work together, a workshop can help to create a sense of community or common purpose among its participants. The beginning of something new. If your organization is adopting a new method, or your community initiative is taking a new track, there are often new pieces of information or ways of functioning that people must learn. A workshop, or series of workshops, is a way to introduce these in a short time and get people ready for the change. The initial training of staff or volunteers. Workshops are often a good way to train new staff members or volunteers in the philosophy, methods, and functioning of your organization, or in techniques they'll need to do their jobs. The in-service or ongoing training of staff or volunteers. Workshops in different issues, techniques, etc. are a good way to keep staff and volunteers fresh and thinking about what they're doing. Staff development. Workshops are often used as a way of honing professional skills and learning about new developments in the field. The demonstration of a new concept. If someone in an organization has been exposed to a particularly exciting new idea or technique, he may want to conduct a workshop on it for his colleagues, or the organization may want to bring in someone to do so. The explanation of something to the public. An organization may conduct a public workshop on its issue, in order to make sure that people are informed about its cause or about what it is doing. An adult literacy program may hold a workshop on illiteracy in its local area, for instance, or a shelter might hold one on the causes and consequences of homelessness. The availability of a knowledgeable presenter. If you have particular expertise in a subject, you may be asked to present a workshop to staff or members of another organization, to the public, at a conference, etc. Well-known people in a given field are often invited (and paid) to travel long distances to present workshops. Even if you've never done it before, you can conduct a good workshop by paying attention to all the phases of the process. There are three phases to conducting a workshop: planning, preparation, and implementation (actually doing it). In addition, once you're done, it's important to follow up with participants to get feedback on the workshop, so you can improve it the next time. We'll look at each of these phases separately. Consider your topic. The first element of planning a workshop is to know what you're talking about. No matter how interactive and participatory your workshop will be, you still have to have a good command of what you're presenting. Do your homework, so that you're confident you can deal with most questions and issues that might come up. That doesn't mean you have to know absolutely everything about the topic, but that you have to know a reasonable amount about it, and understand it well enough so that you can help participants fit it into the context of their own jobs and lives. Consider your audience. Your audience, the people who will actually be part of the workshop, is probably the most important piece of the puzzle here. Understanding them and their needs will do more than anything else to help you decide what to do and how to do it. What do they already know? If you expect most of the participants to be familiar with certain background material, or to have had certain kinds of experiences, that will greatly affect how and to what extent you choose to present material. You can sometimes do some research here. If you're presenting for a particular group or organization, you may be able to find out either from your contact person or from participants themselves who your audience will be, where they're starting from, what their experience has been, and what they want from the workshop. Asking about the audience is part of what a careful presenter is expected to do. In other circumstances at a large conference, for instance, there may be no way to anticipate how much knowledge participants have. In this case, it may make sense to prepare a range of materials and activities, and then begin the workshop by asking people what they know about the topic. By doing that, you can gear your workshop to most participants' needs, and be sure you're neither going over anyone's head nor putting anyone to sleep. Is this material out of their field? Knowing the context of participants ' experience can help you understand how to present material. What is their field? People in some fields may be expected to be more verbal or introspective or outgoing than those in others. You're more likely to find a group of social workers willing to discuss their emotions than you are a group of construction workers, for instance. It also might take more creativity to bring the construction workers to an understanding of why this kind of discussion might be a good idea. It's important to find ways of presenting material that both makes sense to the participants in this particular workshop, and doesn't pull them too far out of their context. In reality, any group can either be very quiet or very volatile, extremely apathetic or extremely responsive, or (most likely) somewhere in between. It depends to a great extent on one or two individuals who set the tone, whether or not the group is one whose members all know one another. What kind of group you have has a lot to do with what kind of workshop will be successful. If the group is very quiet, for instance, discussion may be deadly, but activities based on movement may work well. If the group is argumentative, you may be able to take advantage of that by splitting people up into small groups and having them hash out made-up problems on the topic. Understanding that you can't predict will help you to plan for several different possibilities. Do they know one another and/or work together? If so, you can perhaps dispense with introductions (it depends on how well they know one another), and can plan a workshop that speaks to common concerns. Will they come in with a particular attitude toward the workshop? They will if you're offering material that flies in the face of what they think they know is true. Are you introducing a new concept or method that conflicts with what they've already been doing or with their previous training? If so, the first thing you have to address may be their hostility or skepticism. On the other hand, they might also be biased in your favor if you're offering what seems to be a solution for a difficult problem. This is not to imply that intentionally challenging people's beliefs in a workshop is a bad idea. Assuming you can do it without being disrespectful, like telling them they're stupid, this kind of workshop is often the most powerful, and results in the most significant learning for participants. Most people find change and new ideas uncomfortable to deal with, but are stimulated by them as well. If you can present something new so that participants will consider it, you've more than done your job. Under what circumstances are they attending this workshop? Did they choose it from among several possibilities (as at a conference)? Did they request it? Is it a requirement of their job, or to fulfill requirements for certification, licensure, or some other credential? Is it part of their job (training, retraining, or staff development, for example)? Is it to learn something they absolutely need to know to do their job properly? Each of these reasons implies a different attitude, a different level of interest and commitment, and a different approach on the part of the presenter. Consider the workshop size. If the group is an ideal size for most purposes (about 8-12) you can arrange activities that involve participants as individuals, in small groups (2-4), and in the whole group. If the group is larger than about 15, you'll probably want to split it up for many activities. If it's smaller than 7 or 8, you might be better off having the whole group work together for most of the workshop. The reason 8-12 is an ideal size is that it's small enough so that everyone has an opportunity to have his questions answered and to get some individual attention from the presenter, but still large enough to generate some lively discussion. If the group is larger than 15, the voices of some people, usually those who are quieter, tend to get lost; if it's smaller than 6-8, there may not be enough opinions, questions, and ideas flying around. Consider the time available. Workshops can run from as little as an hour or less to as much as a day or even longer. It 's important that your goals for the workshop match the time available. This means not only planning out your presentation to fill the time appropriately, but also matching the amount of material you'll cover to the time available. Especially if it's all new to participants, they'll need lots of time for clarification, questions, etc. in order to understand it. A general rule about time is that you should try to block out the time for each part of the workshop in advance. Rehearse different parts to see how long they'll take, or how long you want them to take (e.g., if you're going to ask people to write about something, try it yourself and see how long it takes you). You'll seldom be 100% accurate, but you can come close, and you'll then have an outline of the workshop and a reasonable sense of what you might expect to do in the time you have. Short workshop: 45-90 minutes. A workshop this short is even shorter than it seems. People may be late by between five and fifteen minutes, and you'll lose more time if you're distributing materials, using equipment, etc. That means you'll have to ruthlessly pare the material you want to present down to what's actually important. Although it's always wise to overprepare (see Preparation, below), the reality is that you seldom get to everything you expect to do. A workshop of this length is probably best used as a means of introducing and discussing a new concept or an issue of concern. It makes little sense to try to teach a specific skill unless it's very limited. If it can be learned in five or ten minutes, and practiced in the same amount of time, it's worth a try. If it's any more complicated than that, you need a longer workshop. If a particular skill or technique or method is really important for participants to learn in order to do their jobs, or - especially - if its incorrect use will have serious consequences (as in the case of many emergency medical procedures), it is probably unwise to present it in a workshop this short. That could lead to participants believing they know more about the topic than they actually do, and causing real harm as a result. Use your common sense and be guided by what's really possible. Vary activities. This type of workshop is more than long enough for participants to get bored or overwhelmed. Two or three consecutive hours of a talking head can send many people out the door screaming for fresh air. Breaking up the time by involving participants in a number of different kinds of activities is far more conducive to their learning than asking them to sit still and do one thing for the whole time. Attention span: Studies have shown that most people start to lose concentration after 20 minutes to half an hour. By the end of an hour, their level of attention has fallen by more than 50% (and in some cases by a great deal more than that). Attention can be renewed by changing activities, changing topic, changing methods of presentation, etc. Even the short pause in the workshop caused by moving from one activity to another is enough to refresh people and keep them interested. Vary the seriousness of the material. Interspersing activities and ideas that are fun or humorous with others that are more serious can not only keep participants awake and on their toes, but can aid learning as well. Plan a break. This will speak to the attention-span issue and allow participants a chance to get coffee, go to the bathroom, etc. without disturbing the flow of the workshop. But also be aware that breaks always take longer than planned. Add another five or ten minutes onto the time that you ask people to take? you can be sure that by the time everyone wanders back into the room and settles down, they'll have spent at least that much extra time. Even a long workshop isn't as long as you think, carefully reflect on the amount of material you can present adequately in this length of time, and on the amount that people can actually absorb. You might use the time to present a relatively small amount of material in a number of different ways, so that participants will leave with a clear understanding of it. Or, you might select what people really need to know about your topic and concentrate on that, trying to give them enough so that, even if they don't fully comprehend it, they will be intrigued enough to follow up on their own and learn more. In addition to considering how much is appropriate for the amount of time you have, think about how much you know about the topic. Sometimes, the most successful workshops are conducted by presenters who know only slightly more than the participants. In those circumstances, presenters aren't as apt to try to fit in too much or get too technical. Remember how long it really took you to learn this stuff, and to become comfortable with it: it may have been months, or even years, before you understood it completely. Try to recall your introduction to the topic and what you really absorbed, then plan your workshop. Participants need time to talk and connect with one another. The opportunity to get to know others and to exchange ideas is one of the main values of a workshop for many people, and shouldn't be shortchanged. You can go into more detail on specific issues. Here's where you have the opportunity to follow group interest, to explore ideas that are relevant to participants' particular situations, or simply to present ideas in greater depth. You can allow longer blocks of time for activities and single topics. It's important, however, to be aware of the need for breaking up long segments of the workshop. You have to be aware if participants' eyes start to glaze over, and be prepared to switch quickly to something else (particularly something active and fun) if that happens. You can allow more time to practice new skills and more time for discussion about activities. Perhaps the greatest advantage of a long workshop is that it can allow participants the time to reflect, both individually and with others, which is a crucial part of the learning process. You can present both the context and the specifics of the topic (e.g. characteristics of the HIV-infected population and techniques of community AIDS prevention). You can provide or encourage food and drink. It helps keep people alert, sets a relaxed and friendly tone, and sustains interest over the long haul by eliminating the need to think about being hungry or thirsty. It's harder to estimate how long workshop segments will take in a long workshop because presenters tend to let activities go on if they're going well (after all, there's plenty of time), and often find that they can't get to much of what they planned. You need to decide whether you want to stick to your plan and, thus, limit activities to approximately the time you planned for them, or to go with the flow, and let things go on longer if participants seem to find them important. Neither of these options is the "right" or "wrong" way: it depends on the needs of the group and the presenter. Checking in with the group is usually a good way to decide which way to go. Teaching participants a skill which they then might have to use or will use in the future (a first aid workshop for child care workers, for instance). This kind of workshop will generally be light on talk and heavy on activity. If people are going to use what they're learning, it's obviously important for them to practice it, and that is probably what you'll want the workshop to focus on. Giving participants a chance to practice and receive feedback on techniques and concepts they already know. Again, the emphasis here is likely to be on action, on actually doing whatever is under discussion and getting advice and reflection on their performance from the presenter and others in the group. Enhancing participants' current knowledge of concepts, techniques, and methods (new research, improvement of techniques, etc.). A new technique will have to be practiced; a fresh take on a familiar concept might involve only discussion. Teaching participants a new concept that they can then apply to their work (for instance, a workshop for street outreach workers about how gangs act as substitute families for their members). The presentation here might be more discussion oriented, since people will need to assimilate the new ideas and talk out how they connect to and might affect what they do. Familiarizing people with material important for, but not directly connected to, their jobs (Americans with Disabilities Act [ADA] regulations, for instance, or privacy laws). A workshop of this type will probably involve direct presentation of information, with perhaps some problem solving practice and discussion (Person X comes to your organization with this issue; how do you handle it?) It may end up as a question and answer session, partially because laws and regulations are often confusing, and partially because they cause so much anxiety. Providing, or helping to provide, a job-related credential for advancement or initial employment, for instance or for some certification or licensure. This category could include anything from CPR instruction to cultural sensitivity training, and thus might include any number of activities or methods of presentation. Using a workshop as a way of helping participants feel comfortable with one another and/or their situation. Often used in college orientations or in employment-related team building, workshops of this type usually consist of a large number of rapid-fire activities, often eliciting laughter or cooperative problem solving, or both. Any talk is usually beneficial to understanding the activities and their effects on participants. Introducing people to a way of looking at the world, either as an adjunct to their jobs or volunteer situations, or as public education (a workshop on theories of moral development, for example). This kind of workshop can allow for tremendously varied activities: direct teaching, discussion of hypothetical situations, trying to solve moral dilemmas, role playing, etc. In general, the more different ways people can experience the concept, the more likely they are to understand it. Facilitation. Workshop presenters are often referred to as facilitators. A facilitator (from Latin facile, which means "easy") is someone who smooths the way for others. She's not a leader, exactly, or an authority figure, but more of a guide: someone who walks beside you and helps you figure out which way to go. In general, facilitation is more useful in a workshop than "instructing." It's called a workshop because participants generally get a chance to do something, to actually interact on their own terms with what's being presented. A facilitator can help make it easier for them to have that experience, where an instructor might be more apt to tell them about the experience, or to structure it for them. The author's prejudice is undoubtedly apparent here. Virtually all good teaching is really facilitation, at least to some extent. In order to learn anything, and especially to learn it at the deepest level, one has to experience it, wrestle with it, reflect on it, live with it. A good facilitator makes it possible for each participant to relate to new learning in his own way and sort it out for himself, rather than telling him what he's supposed to think or how to approach a concept. Participants are far more likely to stay tuned in throughout the workshop if you act as a facilitator and if you're personally accessible. This is not to say that there's never a place for leadership in teaching, as long as it doesn't dominate the workshop. If the presenter is a "star" in her field, participants may in fact want to hear what she has to say, more than to be facilitated. Consistency of presentation and the workshop's theme. Your method and style of presentation should, to the largest extent possible, mirror the topic. If you're conducting a workshop on experiential education, for example, it should be experiential, not a lecture. A workshop on ADA regulations should be held in a physically accessible space and demonstrate sensitivity to the concerns of the disabled. A technique being introduced should be practiced in presentation as well as in activities. In a well-presented workshop, participants learn as much from methods and style of presentation as they do from workshop contents. Direct involvement of participants. Workshops are much more effective and enjoyable if they involve participants in activities, discussion, and interaction with others, than if they merely shower people with information. There are many opportunities for practicing skills, small and large group discussions, reporting out of discussions, problem solving as individuals and as small and large groups, etc. that will give everyone in the group an opportunity to take an active role. Include some sort of hands-on activity where people can be physically active. Include both group and individual activities. Activities should be entertaining and interactive. Avoid being a "talking head" as much as possible. Include innovative ways of presenting material directly: a play, an interactive skit, a song, a cartoon, etc. Always include practice of a particular technique or method that's being presented, even if only for a short time, to give participants the chance to see what it feels like. The more creative you can get here, the better. Activities in which participants work with physical objects are often great learning tools. There are the obvious ones (workshops for teachers include lots of "manipulatives," objects to demonstrate concepts with), but there are an infinite number of options. The author attended a terrific workshop on multiple intelligences that involved small groups designing and building villages out of legos and other blocks. Think as outrageously as you can. Things to take home. Make sure participants get print copies of any overheads or slides that contain important information, as well as some summary of the main point(s) of the workshop, and anything else you think might be important. It will help them to remember later what the workshop was about, and will assist them in passing the ideas on to others. Reflection time. Reflection is the key to learning. If part of the style of your presentation is to ask participants to reflect on or discuss each activity, you 'll help them learn in two ways: by giving them the time to reflect on the activity and talk about it with others in the group, and by demonstrating how important it is to reflect on what you've done and learned. Time to talk to, socialize with, and get to know the other participants. 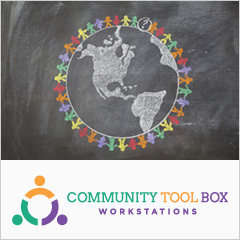 Much of the value of a workshop is in the experience of forming a community of learners. The shared experience can lead to professional collaboration and can enrich the learning that goes on. Now that your planning is done, you need to prepare for the workshop. Planning is about the delivery of the workshop itself; preparation is about logistics, making sure you have the actual stuff and time you need to make the workshop a success. That means both putting together whatever materials you'll be using and getting whatever information is necessary for you to do the best job you can. Find out about the space you'll be using, if possible. If the space is your own, you can choose the room or place that would be best and set it up beforehand. If you're being assigned space in another facility, you may be able to request a particular type or size of room, or may be able to get it set up in a certain way (chairs in a circle, comfortable furniture, etc.). You need to think about how you'll use the space: Will people need to move around a lot? Will there be bulky equipment to move around? Do you need a screen or a blackboard or whiteboard? The more you can learn about the space and the more you can set it up for your needs before participants arrive, the smoother your presentation will go. If the role you intend to assume is that of facilitator rather than authority figure, you'll want to make the space as welcoming and informal as possible. Sometimes that simply can't be done; a school classroom with desks bolted to the floor (yes, they still exist, although there aren't many of them) isn't particularly flexible, for instance. But where you can, arranging chairs in a circle or similar configuration, where everyone can see everyone else and there's no head of the table, can do a lot to set a tone as soon as people walk in. Bring everything you need. Don't assume any of it will be there unless you've specifically arranged for it (see no. 3 below). Even then you can't be sure. If you're going to ask people to write something, or if they might want to take notes, make sure you bring enough pencils and paper for everyone. Make and collate at least twice as many copies as you think you'll need of any printed material you want to hand out. Bring easels, newsprint, and markers for recording ideas, questions, comments, or for documenting what goes on in small groups. If you're making overheads, lists, an agenda, etc., do it well beforehand, not the night before your presentation. If you have to take it all somewhere (i.e. if your presentation is anywhere but in your own space) put it in your car the night before. Make and use a checklist to be sure you don't forget anything. Arrange well beforehand for any equipment you'll need (overhead projector, VCR and monitor, computer, etc.) or plan to bring it yourself. (If you're bringing it, make sure you have a backup in case the one you're planning on isn't working.) Make your arrangements well beforehand (in writing as well as verbally, if possible ), and check a day or two before the workshop to see that everything is in order. Get there early enough to check on it on the day of the workshop. Assume that if anything can go wrong, it will, and that, even if it's not your responsibility, you'll have to fix it anyway. Make materials and hand-outs as attractive and interesting as possible so that participants will return to them. Use color where you can. Easy-to-read charts and graphs are useful for a lot of people (although not everyone), as are pictures. If it's appropriate, organize printed material so that it's easy to read and digest. Outline form, bullets, and the use of color or pictures can all be helpful here. Try to keep the amount of material you hand out under control, unless it's a situation where people really need and want a lot of information (state regulations, for instance, which they may need as a reference over time). It can be helpful to print different handouts on different colors of paper so that both you and participants can easily keep track of them ("Turn to the blue sheet?"). Actual "things" people can take home (AIDS ribbons, miniature model breasts for practicing self-examination) can serve to keep the learning of the workshop in their consciousness. Be overprepared. If you think a block of the workshop will probably last 30 minutes, be ready with at least an hour's worth of material for it. In some groups, you may only use what you thought would take 15 minutes; in others, you may use all of it and wish you had more. It's far better to be overprepared than underprepared: the longer the workshop, the more important this becomes. Without knowing the individual participants beforehand, and often even then, you can't really make accurate assumptions about time or the reactions of the group. If they're already a group (a program staff, for example), they'll already have their own leaders, assumptions, and norms, and those will determine to some extent how they'll react (verbal or nonverbal, engaged or unengaged, etc.) If they're a random group, leaders may emerge, but also may not. As discussed earlier, why they're there, what their background and training are, and simply who they are as individuals will determine how they respond to your presentation. With some groups, no one may speak for the first hour or more, or at all. With others, you may have difficulty getting a word in after the first five minutes. No matter how many times you've presented a particular workshop, it's best to be prepared for anything. The clarity of your presentation. The usefulness of each of the various kinds of activities you included, especially in the context of the participants' jobs or lives. How interesting and relevant the content was to participants. Your command of the material (i.e. how well you knew your stuff). How well the workshop kept people's interest. How well you were able to set and sustain a comfortable tone. There may be other specific questions you have about your particular workshop. Just be sure to keep it short enough so that people will actually fill it out. Finally, get a good night's sleep the night before and allow yourself plenty of time to get where you're going, so you don't feel rushed and frazzled. If the workshop is far from home, and you have the option of staying somewhere near it the night before, take it. If you have the time to relax before the workshop, you'll be more relaxed in the course of it as well. Planning and preparation are done. You're incredibly organized; you have all your handouts color-coded and arranged in the order you want to distribute them; you have activities planned down to the second, with plenty of extras if they don't fill the time completely; you have the room arranged so it will welcome participants and work for the activities you have planned. Now all you have to do is actually pull it off. A workshop, especially a longer one, has distinct phases. There is the introduction, which covers the time from when the first participant walks into the room to when the first topic-related activity begins; the substance of the workshop includes the presentation and activities; and closure involves review, reflection, evaluation, and ending. We'll discuss each of these, with some ideas about how to make them go smoothly. This part of the workshop will let people know what their experience is going to be like. By the time the workshop actually starts, participants often have a strong inkling about whether they're going to like it or not. Thus, it's important to set a positive tone and to make people feel comfortable and interested; to give them some familiarity with you and with one another; and to make sure that they know what 's coming in the rest of the workshop. Setting the tone. There are some steps you can take to make participants comfortable as soon as they walk in, and to establish the workshop as a community of learners. The space. We've already discussed setting up the room so that people face one another, so that there's no obvious place of authority, and so that the environment is as comfortable physically and psychologically as possible. Greeting. As participants enter the room, a process which may cover 15 minutes or more, there is a period when, often, no one quite knows what to do. The presenter may smile and nod as people come in, but the workshop hasn't started yet, and "there isn't anything to talk about." One way to eliminate this awkwardness is to introduce yourself to people as they come in, hand them materials and an evaluation form, and ask them about their backgrounds, or about why they're interested in the workshop. New arrivals can be pulled into the conversation as they come in so that no one feels shut out. By the time everyone is in the room and the workshop is about to start, participants will be talking to one another and to you, and the awkwardness will have given way to conviviality. There may be circumstances under which you might not want to make people comfortable. At a conference, a workshop called "Separate Tables" divided participants up as they came in, with the majority asked to sit on the floor. A small number were seated at an elegantly appointed table and served an appetizing meal. The others about 20? were given a loaf of bread and told to divide it up. The workshop continued in this vein, with the floor sitters eventually protesting their treatment. The point, of course, was to call attention to the lack of comfort that most of the world's population experiences every day, as compared to the position of those in the developed West. Personal introductions. Especially if your workshop involves a lot of hands-on and group activities, it will go better if people are comfortable with one another. If you've started a conversation as they walked in, many participants may already have talked to others that they didn't know, but it still makes sense to introduce yourself and everyone else. You might start by introducing yourself with a (very brief) explanation of why you're conducting this workshop (experience you've had, your familiarity with the topic, etc.). This shouldn't take more than a minute or so. Then, you might use a technique or game to introduce the members of the group to one another (you can also take part in this activity, if you think it will be helpful to your purpose). It includes participants in the management of the session, rather than making them passive receptors of information. It gives participants a sense of anticipation, so they're interested in what comes next. It lets participants know what will happen when lunch is (at 12:30, for example) and eliminates a certain edge of antsiness and anxiety that they often have when they don't know the plan. This is also the time to ask people for their expectations for the workshop, which can be recorded on newsprint or in some other way, and reviewed at the end of the session. If most participants' expectations are significantly different from the presenter's, there may be room for some adjustment at this point as well. If it's necessary for participants to reveal details of their personal lives, for instance, or if the topic of the workshop is particularly controversial, after previewing the agenda would be the time to ask the group to develop ground rules for the session. A few simple norms, such as keeping disagreement away from the personal and respecting confidentiality can make all the difference in participants' willingness to engage with others, and with the ideas under discussion. This is the real meat of what you're doing, the reason why you showed up this morning. What you actually do depends on your own planning, of course, but there are some general guidelines, some of which have already been mentioned, that can make your workshop more effective and enjoyable. Keep track of time. This doesn't mean that you should be a slave to your agenda, but rather that you should be aware when you're deviating from it. In a lot of instances, it might make sense to ask the group how they'd like to use their time: "We're running way over on this activity. Is that OK with you, or are there other things that are more important to you that we should get to?" If you think what's happening is really important and shouldn't be interrupted, don't be afraid to say so. Giving time markers every once in a while ("In 20 minutes, we'll be stopping for lunch") can keep participants going ("I'm hungry, but I can certainly wait 20 minutes"). It will also help you be aware of where you are in the session so that you can, in fact, get people to lunch on time (this may be a major concern, depending upon the facility where the workshop is being held) and conclude the activities with enough to time to close out the session properly. Match the presentation to the content and philosophy of the workshop. As discussed earlier in this section, participants learn both from the content and the style, as well as the methods of your presentation. It's tough to convince teachers to encourage student participation by lecturing to them. If you believe in what you're presenting, you should be demonstrating that by practicing it. People are much more liable to understand and accept what you're trying to convey if it's obvious you believe in and use it all the time. Try to present material in a number of different ways. This variation is important for two reasons: First, it helps to keep participants involved. There are many studies showing that human beings are intrinsically interested in and respond positively to variety, and it makes sense to take advantage of that trait. Second, variation speaks to differences in learning styles, and thus makes it more likely that everyone in the workshop will be able to grasp the material. Although researchers have come up with a number of models for the ways in which people absorb information, none would disagree that individuals differ in their preferred methods of learning. Some people take in new information better through their eyes, others through their ears, others through their fingers (i.e. by doing things with their hands). Some people like to deal with the details of an idea, others with the overall concept. Some learners are systematic and logical, others are intuitive leapers. Still other differences include individual vs. group learning, and fast processors vs. slow and thoughtful ones. Varying activities in a workshop lecture /slide presentation, group problem-solving, building models, etc. can speak to at least most of the learning styles of participants, and create a more nearly complete learning experience for everyone. Try to be, and to make your activities, entertaining. Humor is an extremely important tool, even when your topic is not humorous at all. (The TV show MASH, about Korean War surgeons who dealt with horrible deaths every day, illustrated how black humor could help to keep people sane in an intolerable situation.) It can not only set a tone that makes learning more fun, but can serve to underscore important points as well. A college geology instructor on a field trip with his students pointed out a formation and stated, "This is called a pluck." Then, tripping lightly over to a dead crow on the ground, he pulled out a feather, and said, "This, too, is called a pluck." No one in the class ever forgot what the geological term "pluck" meant. Be enthusiastic. If you really believe in what you're presenting, show it; it will help make participants more enthusiastic as well, and can have a huge effect on the success of your workshop. Encourage participants to relate the workshop content to their reality. How can they use these ideas or methods in their jobs, or in their lives? How would their colleagues react? They need a chance to think about and discuss these questions. You might ask everyone to make a commitment to use something they've learned in the workshop at least once, or to apply new concepts to a particular facet of their work or home life. The real questions that both presenters and participants should be asking themselves about the topic of a workshop are"How does it fit into the world?" and "How can it be used?" Allow ample time for reflection and discussion in all activities. People often need to think and talk through their experiences or new information in order to understand them. It's also important that participants have a chance to be heard about what they think and what they've learned. If they can share it aloud, it gains more importance and legitimacy for them. Even if the workshop content has been understood, it hasn't really been learned until it's been assimilated into the learner's understanding of the world. Reflection provides the vehicle for this assimilation. In the final phase of the workshop, you'll need to wrap things up and give participants a chance to react to what they've just been through. You may want to go through some formal activity for this purpose, or you may want to just throw out some questions and listen to what people have to say. Revisit expectations. Take a look at that list of expectations from the beginning of the workshop. Were people's initial expectations appropriate, and were they met? If not, where were the gaps? Give participants a chance to sum up. This could be as simple as asking "What did you think?" or it could involve a more structured exercise. (One possibility: go around the room and ask everyone to state one thing she liked about the workshop or learned from it, and one thing she would have changed about it.) It's important to give participants a way to summarize for themselves the value, or lack of value, of the workshop for them. Ask for feedback on the ideas, techniques, methods, etc. that you presented. Pay attention to participants' challenges and concerns about the material. It may be totally new to them, and may fly in the face of everything they've learned so far. They'll need time to digest it. Don't get defensive if they don't agree with everything or anything you've been promoting. You may have doubts about some of the material, too, and it's OK to say so. The purpose of a workshop is learning, and that rarely comes without some internal conflict. If you can find a way to record all this review, summing up, and feedback, it will prove extremely helpful to you in developing other workshops, or in revising the one you just conducted. An audio recorder is one possibility. Newsprint or something similar is another. Collect evaluation forms. Make sure you get one from everybody, it should take less than a minute to fill out, unless people have complex comments (the best kind, because they give the most specific feedback). After the workshop is over, there are still a few loose ends to tie up. If you agreed to send anything to participants (materials, bibliographies, etc.) you should do it as soon as possible, both so that you don't forget, and so the material is still fresh in people's minds when they get it. If you have notes on the summation and feedback, you might want to type them up and send them to participants also, if they would be helpful to their understanding of the workshop. Go through the evaluations and your feedback notes soon after the workshop, so that it's still fresh in your mind. What do most people think you might have done differently? What areas seemed particularly strong or particularly weak? This is the moment to think about what you'll change the next time you conduct a workshop, and there should be a next time. Start planning now! In order to conduct an effective and successful workshop, you need to address its planning, preparation, and implementation. As you plan, consider the workshop's audience, its size, its length, its purpose, and your presentation options. Preparation includes logistics (managing the physical items involved, materials, equipment, etc. ), and preparing psychologically as well. Finally, the implementation of the workshop includes attending to all three of its phases: introduction, substance, and closure. And don't forget to follow up, both by fulfilling any promises and using feedback to redesign or change parts of the workshop so that your next one will be even better. Coover, V., Ellen D., Charles E., & Moore C.(1977). Resource Manual for a Living Revolution. Philadelphia: New Society Press. Chapter on workshops, pp. 161 ff. Rohnke, Karl. Silver Bullets. Dubuque, IA: Kendall Hunt Publishing Co., 1984.